By the mid-'70s, when Alan Filreis declared his English major at Colgate University, Wallace Stevens (1879 - 1955) was already constellated among the stars of literary modernism. But Stevens came to us then in very different terms than the other poets whose work regularly graced the syllabi of college English courses. Stevens, who spent his life working for the Hartford Insurance Company (and eventually became vice president), seemed somehow to have remained uncontaminated by the uncomfortable political convictions of other canonical modernists like Yeats, Pound or Eliot. Stevens's poetry seemed indeed almost wholly removed from ordinary life. Leading critics like A. Walton Litz (Introspective Voyager, 1972) or Harold Bloom (The Poems of Our Climate, 1976) celebrated Stevens with books whose very titles suggested a prepossession with loftier things. Stevens became in this way the intellectual's poet, a poet of ideas, exactly the kind of poet some academics sought as evidence that literature is "literature" precisely because it remains above the political and ethical squabbles of any particular day. Times have changed, and in literary study for the better. At the end of the 20th century literary critics work for the most part with a renewed interest in the relations between literature and life. Ironically, this quickened sense of the socio - cultural responsibility of critics to readers has been bad news for Stevens, whose reputation has declined as a result of the very perceptions that once helped establish his place in literary history. Alan Filreis is not alone in attempting to redress this injustice, but with this, his third book on Stevens (ed. Secretaries of the Moon: The Letters of Wallace Stevens & Jose Rodriguez Feo, Duke University Press, 1986, and Wallace Stevens and the Actual World, Princeton University Press, 1991), he has secured an eminent place not only among the arbiters of Stevens's reputation, but also among historians of 20th century American culture. 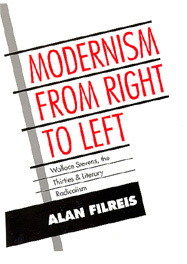 Modernism from Right to Left will probably turn away casual browsers, but it authoritatively documents Stevens's full and particular involvement with the political troubles of Depression - Era America. Filreis proceeds by taking on much of what we have always "known" to be true, and one of his chief staging grounds is a long poem Stevens published in 1936 called "Owl's Clover." "Owl's Clover," which is not even included in Stevens's Collected Poems, has long been thought either an anomaly in the poet's work or an aesthetic, reactionary rejection of the leftist politics that for many marked the '30s as the "red decade." In fact, "Owl's Clover" is, as Filreis documents, neither a rejection nor a straightforward acceptance of the left. As the title of his book indicates, Filreis charts a gradual shift in the poet's orientation. Stevens never became a "leftist" poet, but his poetry performs a conscientious self - examination that in its own terms perceptibly turns poetic response to responsibility. To follow the process by which Filreis develops the evidence for this kind of historical revisionism is to understand something important about literary study in our time. For a literary scholar, the ultimate evidence is always textual. But, because Filreis asks different kinds of questions than did his own teachers at Colgate, he contextualizes textual evidence, and regards individual poems not in isolation but in their contemporaneous relations to other poems, and other kinds of writing. The research that informs Modernism from Right to Left is both impressive and impressively marshaled. The author ranges among the works of Stevens and his "modernist" cohorts, lesser known political poets of the period, and the historical records of the Hartford Insurance Company � in some ways proving that literary scholarship can still be dusty work. Of course, such contextualizing activity can be deadly if readers care nothing for context, and Filreis's project draws much of its vitality from the old - left writers whom he has exhaustively interviewed and studied. The cultural changes of our last half - century have occasioned the general dismissal of '30s radicals as being anti - art, and Filreis endeavors to save their place in a more broadly conceived American heritage.